Sally Field lived different lives onscreen and off, but the world didn’t know that until she shared her story in here recent memoir, In Pieces. On screen or stage she immerses herself in a character’s life, literally becoming Sybil or Norma Rae, and leaving her awareness and her life outside. She taps into deeply emotional experiences and uses them to create convincing characters engaged in life changing roles. For much of her life, though, she was shy and susceptible to the will of others. She admits she was uncertain of who she was if she did not have a script in front of her. Her step-father manipulated that need, creating guilt trips. Her mother, an actress in her own right whose career diminished as she aged, offered wonderful support yet was blind to some of the issues troubling her daughter.Lee Strasberg, her acting coach lavished her with praise until she stopped growing as an actor. Then he came down hard on her. Though we remember her playing a wide range of characters from Gidget to Mary Todd Lincoln, this memoir is the first time place she’s shared the whole story of how her personal life and the guidance of Lee Strasberg helped her find her unique voice. From the silly situation comedies of Gidgetand the Flying Nunto the disturbing story of Sybiland the uplifting tale of Norma Rae, she’s shown how vivid, clear, and emotionally honest her work is. Large parts of that come from a merging of real life and acting skills. A lot of the publicity surrounding this story refers to the sexual abuse she put up with, but this is far from a Hollywood tell-all. In Pieces is a story of survival, strength and late-in-life discoveries. Field is a two-time Academy Award and three-time Emmy Award winning actor who has portrayed dozens of iconic roles. In 2012, she was inducted into the American Academy of Arts and Sciences, and in 2015 President Obama honored here with the National Medal of Arts. She has served on the Board of Directors of Vital Voices since 2002 and also served on the Board of The Sundance Institute from 1994 to 2010. She has three sons and five grandchildren. I highly recommend this remarkable book—especially the audio version. Fields reads her own work aloud, filling it with nuances, vivid memories, and an increasing understanding of who she is. 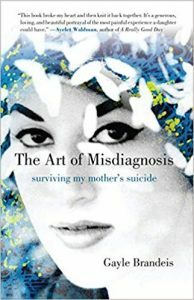 Though Gayle Brandeis’s memoir, The Art of Misdiagnosis, gives a whole new meaning to the sandwich generation, it goes much further. Brandeis grew up faking illnesses as a means of getting attention and being special. Her mother leaned into it, declaring that the doctors were making one misdiagnosis after another. She got healthy, got married, and had just given birth when her mother hung herself in a parking garage, even though she was in the midst of a creative film project called The Art of Misdiagnosis. The memoir is partly about the sweetness of being a new mother, partly about the strain in Brandeis’s relationship with her own mother, partly about misdiagnosis and misunderstanding, and partly about the ways unspoken issues can destroy us. Part reflection, part Art of Misdiagnosis script, part letters to mom, this book explores relationships, confusion, life, loss, and misunderstanding. There are many mother-daughter memoirs on the market. This one stands out because the author digs deeply as she explores her mother’s illnesses making discoveries and taking responsibility. Her mother speaks from the grave as Brandeis shares parts of her documentary. Suicide, disease, and mental issues are difficult issues to deal with. Brandeis’s explorations are heart-felt and nuanced. 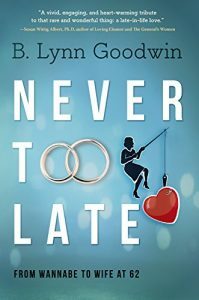 She takes the time needed to delve into the mysteries of thoughts gone awry and unspoken secrets, which I cannot identify without avoiding spoilers, but as she does so, she shows readers how to heal themselves. Though Brandeis speaks for and about women, men should read this book too, especially if they work in any branch of the medical profession. We are all complex human beings and her memoir asks many questions that most of us wonder about, whether we admit it or not. Let her insights help you explore your own views. Highly recommended! In Visits and Other Passages, Carol Smallwood writes short stories, diaries, fantasy, poetry, and essays to offer her explorations of everything from the color pink to a letter to God. All from the heart of American life. In, “A Visit from Caesar’s Wife,” she writes: “Avon made me feel a part of things: it was as American as McDonald’s, the Fourth of July, or the Reader’s Digest.” This sets the tone of the collection and the evolution of her world. Her poems are also remembrance and reflection. “A Lace Piece” ponders the fragile beauty of lace, its history, universality, and grace. In “Grandmother Said,” she interperses thoughts on her grandmother with the universality of hand sewing, which her grandmother valued greatly as a way to address loneliness. Smallwood ends with a poem called “Passage,” which she starts with “summer ice, pleasure of the moment: / proof of time’s passage” and ends with “evaporation could be measured / if there were days enough— / but ice has many forms.” The momentary nature of time and the multiplicity of forms, whether of ice or of the passages in this book. How does dysfunction affect a woman’s future? Though many authors have tackled this question, none have done it in the same way as Terese Marie Mailhot, who began Heart Berries while she was hospitalized for PTSD with bipolar side effects. This powerful story shows her finding her place in the world. It’s written with honesty and passion, and it makes readers wonder how she managed not only to survive but to thrive. With ferocious conviction and a unique voice, she explores the world as a woman raised on an Indian reservation in British Columbia. She is proud of her heritage but feels caught between caught between strength and degradation, between presence and disappearing. Overwhelmed, she’s hospitalized for mental illness, or speaking her mind, or a combination of the two. She describes her father as an abusive alcoholic, but she cannot leave it at that. If she portrays him as a monster, she is implicating herself as part monster. She fears she inherited generational trauma, and she obsesses about it, looking at her culture and herself. She is equally obsessive about the fact that memory is imperfect. She went to great lengths to check her stories with people in her family, who sometimes remembered things differently.Heart Berriesis about her truth as an Indian woman and a writer rather than absolute truth. The introduction by Sherman Alexie confirms the validity of this story. Author TERESE MARIE MAILHOTgraduated from the Institute of American Indian Arts with an M.F.A. in fiction. Mailhot’s work has appeared in The Rumpus, the Los Angeles Times, Carve Magazine, The Offing, The Toast, Yellow Medicine Review, and elsewhere. She was recently named the Tecumseh Postdoctoral Fellow at Purdue University and resides in West Lafayette, Indiana. Endorsers call her work “brave and fearless” and “carefully crafted literature.” She spilled her guts and honed the raw material through reflection and poetic language until both her emotions and everyone’s motives were thoroughly explored. You will not see the world or your unique place in it the same way after reading this book. Definitely worth your time! What do you do when you’re 17 and your world falls apart? What do you do if you love drawing fashion and your dad wants you to major in ornithology or some equally uninteresting science? What do you do with justified anger that steamrollers through your body? While there are several possible answers, if you are Claire, the protagonist in Jill Hedgecock’s Rhino in the Room, you resist going on an African safari with your self-centered, obsessive dad—the guy you caught cheating on your mom. When that doesn’t work, you act out until the rest of the people on the tour ask the guide to put you off their tour. Instead of sending Claire home, though, the tour guide puts the two of them on a separate, better tour, complete with a dreamy-looking tour guide. Life is looking up until circumstances alter Claire’s priorities and she starts looking at the foxy tour guide, the father she’s challenging, and even the endangered rhinos in a whole new way. 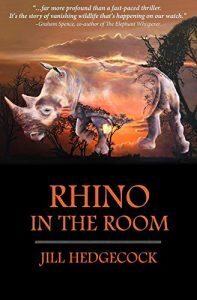 This YA book is most unusual because the safaris offer a huge amount of information about African wildlife, about rhinos and those who poach them, and about the fragile balance among humans, animals, and the world we all share. Teens will love the drama, their science teachers will love the flora and fauna, and social studies teachers will love the colliding of two cultures. Parents will applaud a balanced look at the character’s motivations. There’s something for young and old alike. If it’s not right for you, you may know someone who would love it. Highly recommended. NOTE: If you would like to be a reviewer, please click the contact button and query us.